I have a personal tradition for Christmas. Every time the holidays roll around, and I am out and about getting gifts for my parents, I always make sure to pick them up a couple of ornaments. A new Santa one for my father, and a new snowman one for my mother. Fancy. Cute. Interesting. Whatever the make, I make sure that whichever I choose is a fun one to unwrap. If World Trigger were a gift, I would never give it to my parents. I would never give it to any of my friends or strangers on the street. I wouldn’t even give it to my sworn nemesis. In a world where evil Neighbors invade and Triggers are used, Osamu, a teenage boy yearning to become a member of the protective Border Agency, has a fateful encounter with an even younger boy named Yuma. Yuma, as it turns out, is also a Neighbor, but he has come to make peace not war. These two, together with their close friend Chika, find themselves supporting one another as they face the troubles laid out on their path. This description is not a thorough one for World Trigger, for the anime is seventy-three episodes long. True, it is not as long as those most popular, long-running shows, but seventy-three is not a number to scoff. After all, the majority of anime are either twelve or twenty-four episodes in length. Unfortunately, its length is also its downfall. Repetition is a concept that many people are familiar with. Especially if they watch anime or take part in discussing them. Repetition can be a positive if it is used as a plot point or as a thematic element. Often, though, it is a negative, demonstrating a show’s inability to add variety or a need to linger on the same events, outcomes, and character appeals. World Trigger takes it several leaps further. It’s almost astounding how much the show repeats itself. Take its in-world knowledge. The different weapons, the types of Neighbors, how the structure of Border works. A lot of time is set aside to explain these arguably minor details. A smart move. Giving the audience more about how everything operates is (usually) worthwhile. But, in what can only be described as a blunder, the anime has this segment at the end of almost every episode called “World Trigger Fun Facts.” There, they repeat much of the same information that was already given. Those weapons? Here they are again with next to nothing new added. Those Neighbors? Covered once more with the same information. Those rankings? S, A, B, C is “tough” to remember, so it’ll be wise to break it down again. These “fun” facts do not stop here because, once the anime reaches roughly past the halfway mark, it begins to repeat the same info from previous segments. The guns, the Neighbors, the rankings. A lot of it is repeated – again. How about always displaying the names, ages, and roles of the different characters no matter how many times they are seen? The invariance of enemies? A need to litter every battle with explanatory dialogue rather than letting them play out? Yet the worst (best?) example is each episode’s opening. In almost every single episode, the anime replays a fixed reel with narration played on top of it. While it can change when the arc does – about once every fifteen episodes or so (so about five different sets in total) – it takes up roughly a minute and thirty seconds of that episode’s time. Which in turn takes away the show’s chances of doing something not repetitive. The kicker? The anime will then proceed to replay exact scenes from the previous episode. As though the reels were not repetitive enough, the show makes its audience sit through reused material that contains verbatim dialogue and replicated events as if it’s expected. Episode forty-one is particularly egregious: The first four minutes and twenty seconds are literally the overused reel and copy-pasted content from the previous episode. The repetition is horrible, but, somehow, the anime does not stop hitting itself in the face. Pacing manages to be a problem. The first arc is recognizably slow as the show takes way too much time in setting up its characters, world, and general atmosphere for roughly twenty-one episodes. During this span, the anime does have a couple of battles and a bigger fight break out to help minimize the monotony, but it is still noticeably slowed down. From episode twenty-two to thirty-five, the anime enters its large-scale-Neighborhood-invasion arc, and it is at this point that pacing goes out the portal. Over the course of these fourteen episodes, the anime stretches out hours of in-world time, slowing everything down again. It even goes so far as to extend seconds of in-world time (into minutes of airing time), killing any reasoning for the pacing. World Trigger gets its pacing wrong again when it halts the progression of its B-Rank-Wars arc in favor of the Xeno-and-Lilith arc. Doing so killed the build-up, the sense of progression that Osamu, Yuma, and Chika had been making. It resumes the B-Rank-Wars arc later, sure, but, by that point, the paced-based damage had been done. And as if the show could not get any worse, it makes some questionable choices throughout its run. That Xeno-and-Lilith arc has no consequence on the events within the season. The idea is that what the group did will pay dividends sometime in the future. But, for the here and now, the arc represents nothing more than an unnecessary diversion (especially since they were supposed to be training but had to deal with this whole conflict instead). The idea behind triggers switching out one’s physical body for a virtual one, while futuristic, removes a lot of tension since their actual bodies are in no real danger. Episode sixty interjects the arc that already interjected the arc before it. It’s meant to be a comedic one-off starring “Tamakoma branch’s most powerful member,” but it has no place in the occurring narrative. Even how the season concludes raises eyebrows. It chooses to make the cutoff right as the newest Neighbor invasion starts as well as right before Osamu and the others go into the pivotal B-Rank match. The latter tears the muscles around the eye. They aimed to win the B-Rank wars (and thus go on the away missions into the Neighborhood) all the way back in episode eleven. Meaning, even after the remaining sixty or so episodes unravel, the show fails to accomplish its original goal for the season. All these problems are bad on their own, but, again, they occur across seventy-three episodes. In other words, the repetition, the pacing, and the poor writing choices are each compounded, exacerbated by the long length of the season, turning these problems from intolerable to wholly insufferable. 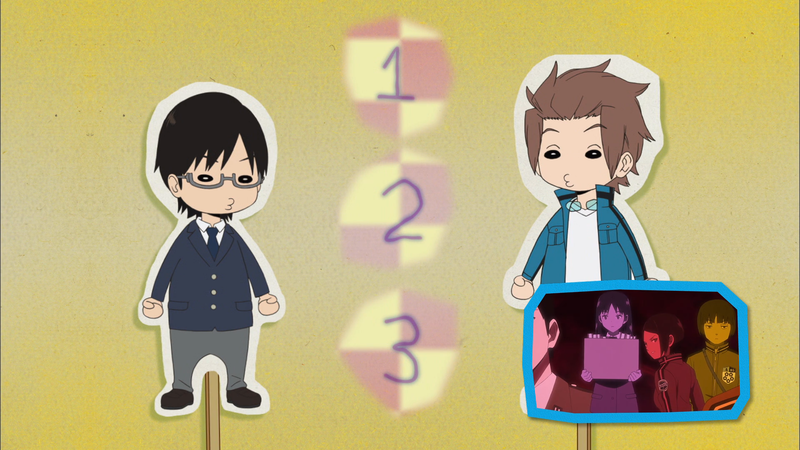 World Trigger has a clear positive in its visual arsenal: The trigger transformation sequence. 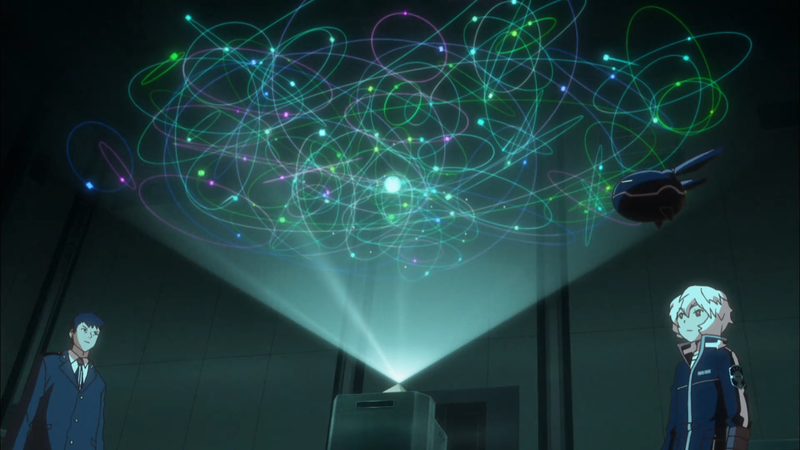 Blue-and-purple, space-like effects spread over the characters as their virtual bodies replace their physical ones. It’s fancy-looking, and it works. Oh, do not be mistaken. Repetition does not stop with the story. The transformation gets a pass because it at least tries to be interesting. But Yuma’s squinting face? The drab teal outfits? 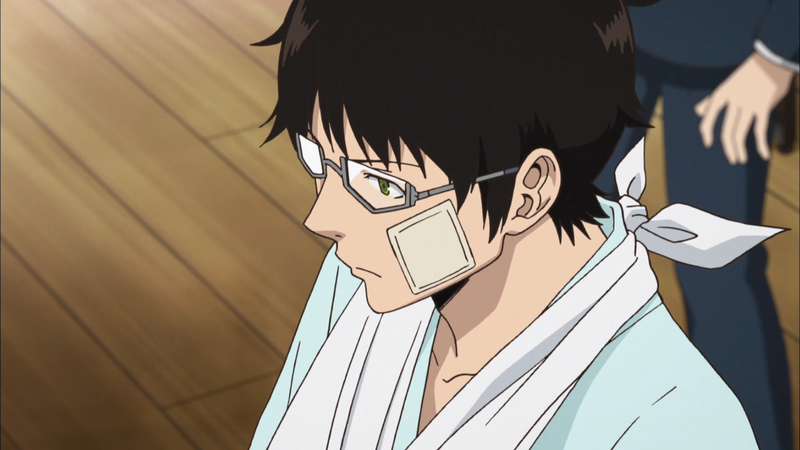 Osamu’s glasses constantly fogging up on only one lens to make him seem serious when, in actuality, it only makes it look as if he does not treat his eyewear with proper care? The setting, too. The show almost exclusively takes place in the same city and within the same Border headquarters. It would not be a problem if the anime attempted to spruce up these areas given that they are seen all the time. Nope. It’s the same low-detailed, repetitive locations. It does try to break up the monotony with its weapons and its enemies, but these, too, suffer from lack of intrigue. The weapons are mostly swords and shields (and their variants) that go without any distinguishing characteristics besides their yellow-laser composition. And the enemies are giant, bug-like creatures that go featureless save for their same giant-eye weak-point. At the very least, the anime’s character designs are not awful. Yes, Osamu is too plain, Chika’s mouth is oddly triangular, and Yuma already needs to dye his hair as a teenager. But, considering the size of the cast, the changes to hair color, pupil formation, body image, styles, and accessories help to differentiate the characters while also giving them their own personalities. Kirie, in particular, gets a brand-new look when she turns on her trigger: a winged hairstyle as well as a light-green outfit. Then it goes right back to being intolerable with subpar actual animation. The fights are not given enough room to breathe, characters usually only move their mouths, and everybody has a hard time even walking around the room as they discuss the same set of topics for the umpteenth time. At least the glowing cube pieces dart around, right? A few negative shout-outs are still in order. The first goes to the visuals for the second ML (acronym explained later) track. Having each character “sing” a portion of the song is not cool in the slightest. Especially when Chika, a female, lip syncs a male’s voice. The second goes to the final episode. It is somehow leagues worse than all the episodes before it. Disproportionate heads, stiff animation, and weak choreography end the anime with even more distaste. The third goes to the “fun” facts epilogues. They went cutesy and minimalist to fit their “fun” mood, but it really just seems as though the anime was cutting corners with the cutouts. 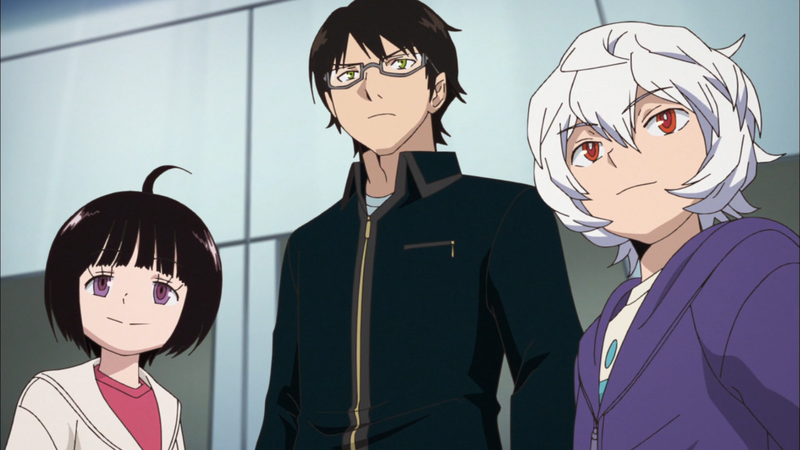 World Trigger is yet another anime with a massive cast, reaching about one-hundred distinct characters. Therefore, just the main four will be investigated: Chika, Jin, Yuma, and Osamu. Chika is a young girl who finds herself attracting the evil Neighbors. It’s not her fault, for she simply contains an unbelievable amount of Trion (especially for someone of her size). Her indirect relation with the Neighbors caused her to distance herself from others in order to protect them, leaving her in a spot without too many friends. Unfortunately for Chika, and early on, the show reveals that not only did the Neighbors kidnap one of her close friends, but also her brother went missing beyond the rift, too. In retaliation, Chika enlists herself at Border to save those that were taken from her. The beginning of the season only gives the audience the tidbits to her background and motivations. The middle section has her being the target of Aftokrator because, to them, she is the “golden baby bird” they were seeking. In other words, Chika does not do a whole lot for a long while. Not until the last one-third or so does a new characteristic officially enter the field: She cannot shoot people. Her mental obstacle is extremely annoying since it comes off as a cheap excuse to stop her from decimating the competition (when most of her foes are in no danger of dying anyway). But it does give her the chance to grow. She eventually manages to fire her gun as well as changes to a different setup that plays to her strengths. Namely, her huge store of Trion. Is Chika a strong character? No. Mostly since she’s relegated to the side without accomplishing much. However, she’s the best of the four – and that is telling. Jin is notable for his amazing “Side Effect,” special abilities that certain characters possess. His Side Effect is reading the future. He cannot predict it, but he can see the various intersections as well as influence which one the world could take. If that were not enough, he has his own Black Trigger, making him one of, if not the, most powerful Border agent. Jin does receive some attention early on, being the one that inspired Osamu to put his all into joining Border. And he interacts with Osamu and his group often enough, getting them a spot at his branch as well as looking out for them elsewhere. Unfortunately, his character starts to go downhill shortly after. Jin gives up his Black Trigger, sensing (through his Side Effect) that it would be for the best to let others wield it, reducing his overall impact and coolness. Then, after warning about Osamu’s potential death during the Aftokrator arc, he basically vanishes, appearing only a handful of times without having any impact on the events at hand. Jin even (way later) turns down Osamu’s invite to their group, a bold move to make Osamu’s team that much stronger. Which begs the question: Why is Jin even considered a main character let alone plastered on the front of the anime’s main graphic? His background is not investigated, he does not have an internal conflict, and he sits on the sidelines for a large chunk of the show. In all regards, he’s a massive step down from Chika. Yuma is technically a stronger character than Jin but not by much. Yuma is a humanoid Neighbor, something that Osamu and the others had never heard of before. Yuma, alongside his trusty pal Replica, has a Black Trigger of his own, granting him boosted powers and increased battle prowess. But, as his background shows, he does not necessarily need it. When he was in the Neighborhood, he was with his dad, learning about fighting, skills, and battle tactics. In other words, he was already a seasoned fighter. Sadly, a dark entity maimed Yuma, forcing his father to sacrifice himself. In exchange for his life, he creates Yuma’s Black Trigger, saving Yuma by placing his body within it. I.e., Yuma’s current body is actually a fake. All this information on Yuma is revealed rather early on (mainly episode eleven). And, to be fair, it is welcome info. The problem is that that is all Yuma has. He’s already a versatile fighter, so the battles do not mean much to him. The show never goes back to the Neighborhood, so he does not get context on his background. And he does not have any notable interactions with any of the other cast members, including Chika and Osamu. Speaking of Osamu, he is easily the worst of the bunch. From the very beginning, it’s obvious that Osamu has no latent strengths. He is not suited for Border due to his lack of fighting experience and his lack of Trion. He only gets recognized when Yuma gives him the credit for saving the school. And that’s Osamu’s character for the rest of the show. He is constantly trying to find an out. He is constantly looking for help. He is constantly doing what he can to not be useless. It would have been tolerable had he actually grown at a steady pace, but, at every junction, World Trigger seems intent on keeping Osamu at a below-average state for the entire season. His crawl is realistic, sure. Going from the absolute bottom to even near the middle of the pack would not (should not) happen overnight. But the anime is seventy-three episodes long. What is normally a crawl turns into an excruciatingly slow waddle that barely gets him past the base of his figurative character mountain. This problem is World Trigger’s biggest. It fails to use its very long season to its advantage. Instead, the show’s main four not only reach a new level of stagnation but also fail to feel meaningful to the story at large. One argument in favor of the cast is their roles. Yuma’s the ace fighter, Chika’s the overpowered sniper, and Osamu’s the tactician. They form a solid group whose weaknesses are covered by each other. 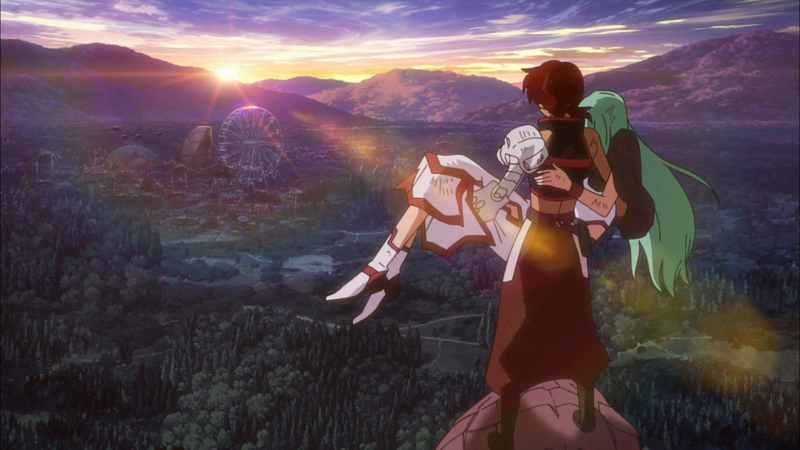 For instance, Yuma takes on the toughest enemies, Chika destroys landmarks when needed, and Osamu develops the plans. Their composition, however, is not enough to elevate their individual persons. 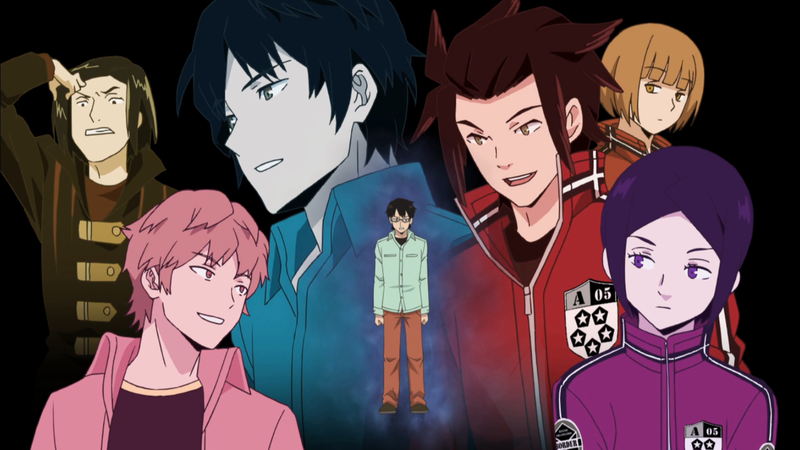 The best character World Trigger has to offer is not out of these four; it’s Xeno. He confronts the main group, has a personal conflict in trusting others, gets his background explored, holds a special relationship with Lilith, and resolves his conflict when he befriends the others and escapes the planet. But one strong side character – a character that is inconsequential to the proceedings – is not enough to save this anime from the abyss. World Trigger, surprisingly, does something unique. Not good unique but unique nevertheless: It does not have an OP or an ED. Oh, no. Instead, the anime created a brand-new entity. The middle track (or ML for short). Remember those repetitive reels? They almost always play at the beginning of each episode, leaving no time for an OP to play. And remember those “fun” facts? They almost always play at the end of each episode, so an ED has no place. That leaves the meat of the episode. The important parts. The middle. So, World Trigger, being World Trigger, does not care. With its ML in hand, it will interrupt the flow of the episode to make sure the audience hears what it has to offer. Sometimes twelve minutes in, sometimes a staggering fourteen minutes and thirty seconds in. It must play it. What is heard? The first ML has fast lyrics, but the “change the new world” English bit and the boring background beat squash any hope the song has at becoming listenable. The second ML tries really hard to be cool, with its different vocalists and fade out, but it comes off as incredibly lame since the anime is simply not on the same coolness level. As for the third ML, it stands above its brethren, but that’s not saying much. Its first half is uninspired, but the second half at least has some nice vocal work and a varying pace, making it the only passable piece of the bunch. When the ML is not playing, the rest of the original soundtrack does instead. The tracks are often slow, ambient tunes, relying on flutes, drums, and reverb effects to strike at the slice-of-life, action, and sci-fi moods. They’re forgettable pieces, overshadowed by the ML’s strangeness. Not to be outdone, voice acting missed the mark. Megumi Urawa as Youtarou was annoying to hear, and Tomo Muranaka as Yuma sounded too disinterested. The others failed to impress. You know what’s ironic? My favorite part of the entire show happens to be repetitive. Kirie and Kyousuke’s running gag, where he lies, she believes him, and then she proceeds to pound on Osamu or whoever else is nearby for “tricking” her, miraculously made me smile. In this swathing sea of dislike, I did, indeed, find something I liked. The cat, too. His emotionless stare and laziness was likable. And those are the only parts I liked. Kitora was a huge jerk to Osamu for no other reason besides thinking he was coddled too much by everybody else. Chika always bailing out during the fights, rather than trying to help Osamu and Yuma, got on my nerves. Osamu’s half-fogged glasses. Can’t say I liked the action with its boring shoot-outs. I did not have much in the way of romance to cheer for. Takeru’s “comedy” made me want to punch myself in the face. And don’t even get me started again on the show’s inept repetition. Is this the worst anime that I have ever seen? Maybe. If nothing else, it is trapped at the bottom with the other lowest-execution anime. World Trigger is a boring mess. The story is repetitive. The characters are stagnated. The art is lame. The music has no timing. The entertainment value is minimal. The anime is an ornament that shattered into seventy-three different pieces: worthless.